Like I said these apps use all the existing web standards. They are rendered using the Webkit engine so the results work the same as they would in a web page. The workout data is all stored in a SQLite table which is part of the new HTML5 spec and works just the same in the WebOS environment. I need to say that the app does use a stylesheet but the only styles I've applied here were for positioning and for the size and color of the large readout font on the initial view. Everything else(buttons, lists, etc.) 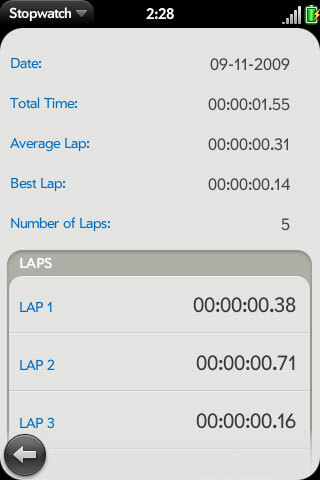 with the exception "+" and old fashioned stopwatch icons are the standard WebOS widgets. As someone who is a front-end developer and has no Rails/PHP type knowledge developing a mobile app on WebOS was really very easy. Since it uses a language I already use the learning curve was really limited to the Mojo framework as well as the Mojo components. For those of you who have great ideas for a mobile app or are just interested in exploring but feel iPhone apps are out of your league I encourage you to try a WebOS app. 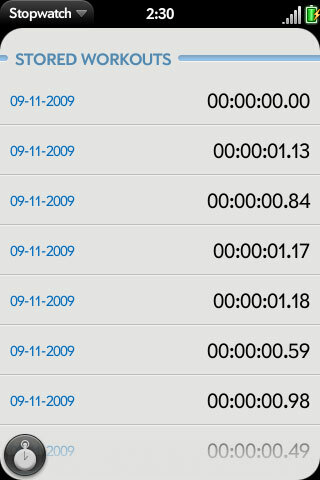 Source files for the Stopwatch application.